A YouTuber's allegation that the family-friendly restaurant recycles its pizza slices has gone viral. A long-standing rumor about one of America's biggest kid-friendly restaurant chains was just reignited by a YouTube star — and the allegation was so wild that the restaurant finally responded. 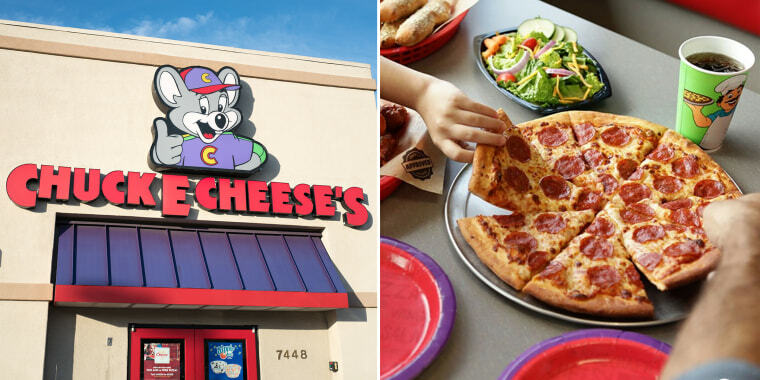 Over the years, several blogs and forums have questioned whether Chuck E. Cheese’s servers take slices of pizza its customers do not eat and cobble them back together to create new — if slightly misshapen — pizzas to re-serve. Various photos of pizzas with mismatched edges on social media seemed to provide plentiful evidence for YouTuber Shane Dawson (who has more than 20 million subscribers), so he went to a Chuck E. Cheese's to try to confirm or dispel the myth once and for all. On Monday, Dawson posted the latest segment of his "Conspiracy Series" videos. In the video, which covers a few subjects, Dawson claims that he first noticed the mismatched slices as a kid and that one time, his family even received a pizza that had a lone vegetarian slice wedged into their order of a half-cheese, half-pepperoni pizza. He points to numerous photos others have posted of their meals that allegedly came from Chuck E. Cheese's. "I went there a lot [as a kid], and it was always, like, displaced pizzas," Dawson says in the video. The YouTuber eventually heads to a Chuck E. Cheese's with a few buddies, orders a pizza — which does appear to arrive with some uneven slices — and then proclaims that he's pretty sure old pieces have been reassembled. Dawson's video may be new, but the rumor about whether the family-friendly chain has been serving Frankenpizzas has been around for at least 10 years; folks on Yahoo! Answers even debated the idea. With more than 15 million views, however, Dawson's latest episode has prompted Chuck E. Cheese's to address the myth for the first time publicly this week. When reached via email, a representative from the restaurant issued the following statement to TODAY Food: "The claims made in this video about Chuck E. Cheese’s and our pizza are unequivocally false. No conspiracies here — our pizzas are made to order, and we prepare our dough fresh in restaurant, which means that they’re not always perfectly uniform in shape, but always delicious." In 2018, the chain posted a start-to-finish video of its pizza-making process, which prompted many surprised reactions from people who thought the chain just served reheated frozen pies. One Reddit user, mball98, offered a possible explanation for the strangely shaped pizzas, commenting that it could be due to human error, especially if someone in the kitchen is new at cutting pizzas. Sliding pizza slices from a hot pan onto a serving plate may also account for some of the uneven spacing. In addition to the chain weighing in, several people who claim to work at Chuck E. Cheese's have posted responses defending their employer, while also refuting the idea that they recycle old slices. YouTube user Destinee Cordova, who claims that she works at Chuck E. Cheese’s, filmed a video in which she says she can’t ever imagine the practice occurring at her restaurant. More people who claimed to be current employees at the cheesy chain took to Twitter to deny that any food recycling occurs behind the scenes. Of course, social media is now littered with even more pizza shots showcasing uneven circles. And there's even a "chuckecheeserecyclesquad" account that appeared on Instagram. Of course, the whole controversy is not without its share of comical reactions, too. Shane Dawson: do you think chuck-e-cheese's recycle pizza?? Pizza recycling stories aren't just limited to Chuck E. Cheese's restaurants. In October, a viral video that showed a woman at a Little Caesars shop counter with a bunch of DiGiorno pizza boxes sparked a frenzy among millions of confused viewers (including Chrissy Teigen), who questioned the true origins of the "Pizza! Pizza!" chain's food.